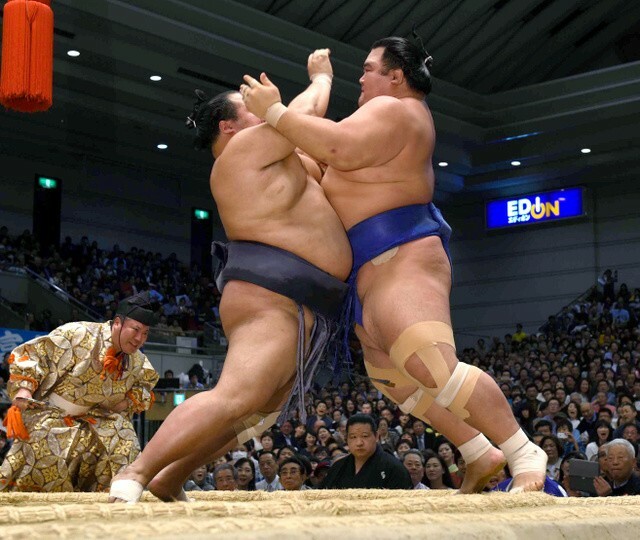 L’ôzeki Kisenosato maintient sa position de leader après sa victoire convaincante contre le maegashira 2 Okinoumi samedi. 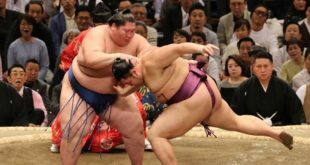 Kisenosato reste en tête du championnat en compagnie du maegashira 4 Ikioi. 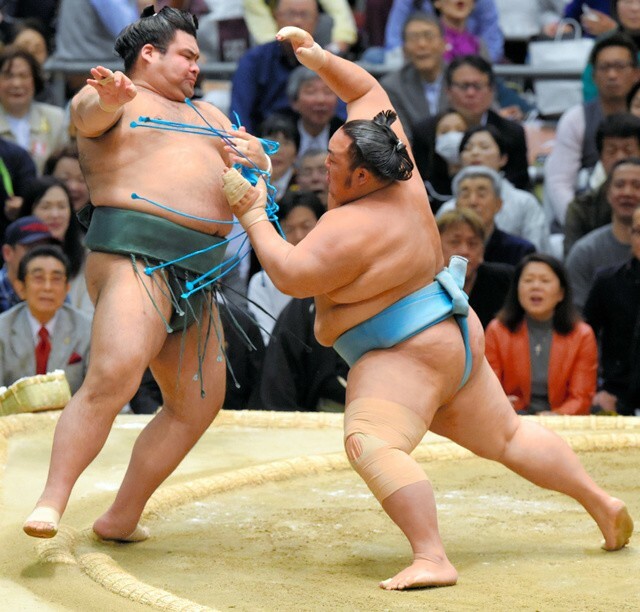 A la recherche du premier titre de sa carrière, Kisenosato a livré un combat efficace contre Okinoumi en profitant du tachai pour saisir son adversaire à la ceinture puis en le sortant. 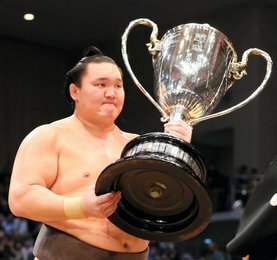 Kotoshogiku, qui souhaite remporter son deuxième tournoi consécutif pour entrevoir l’opportunité d’être promu yokozuna, a eu une belle frayeur face à son ami d’enfance Toyonoshima. Toyonoshima, le seul a avoir battu Kotoshogiku en janvier dernier, était très proche de l’emporter en poussant l’ôzeki en équilibre précaire sur les ballots de paille. Kotoshogiku a réussi à se maintenir à l’intérieur du cercle avant de renverser la situation en sa faveur après avoir poussé vers le bas le sekiwake. La journée s’est terminée sans aucun bouleversement parmi les échelons supérieurs. 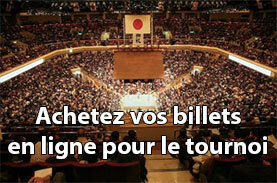 Ainsi, les trois yokozuna et les quatre ôzeki sont sortis indemnes de leur rencontre. 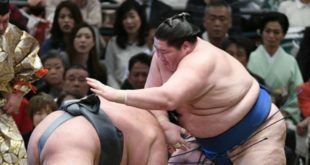 Le yokozuna Kakuryu a cependant rencontré plus de difficulté que ses camarades avant de prendre le dessus sur le sekiwake Yoshikaze. 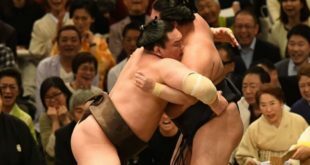 Harumafuji s’est montré une nouvelle fois très expéditif dans sa victoire contre Aoiyama en le chassant à coups de gifles. Goeido s’empresse de cumuler les victoires pour sauver son rang. Aujourd’hui l’ôzeki kadoban a terrassé le vétéran Aminishiki. Terunofuji a surmonté le tenace Sokokurai en obligeant le chinois à sortir du cercle. Ikioi, natif comme Goeido d’Osaka, reste invaincu suite à sa septième victoire obtenue contre Myogiryu. Demain les deux leaders seront départagés puisque Ikioi rencontrera l’ôzeki Kisenosato. En jûryô, c’est toujours l’égyptien Osunaarashi qui reste en tête avec un score parfait. Ozeki Kisenosato maintained his perfect record with a convincing win over No. 2 maegashira Okinoumi on Saturday, staying in the lead alongside No. 4 maegashira Ikioi after the seventh day of the Spring Grand Sumo Tournament. 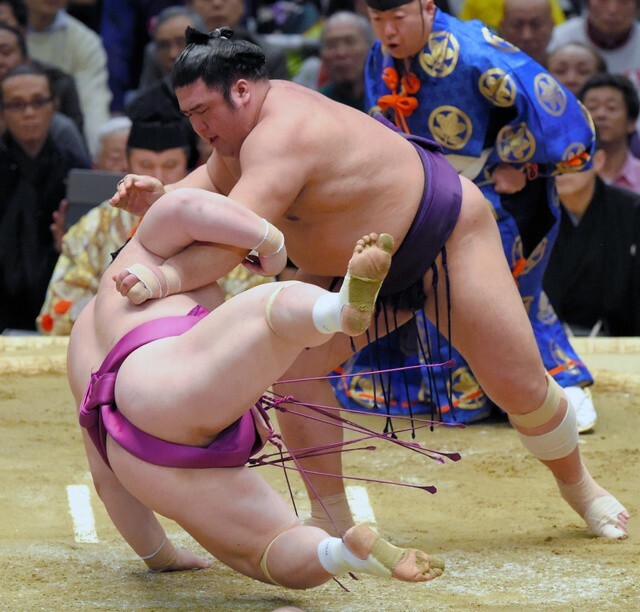 Seeking his first career championship, Kisenosato (7-0) had a solid bout over Okinoumi (1-6) as he charged low off the tachiai, grabbed an underarm belt hold with his left hand and grappled his opponent out, leaving him no room to counter. Fellow ozeki Kotoshogiku, in the hunt for a second straight championship that could potentially see him promoted to yokozuna, survived a scare to keep that dream alive against boyhood friend Toyonoshima. 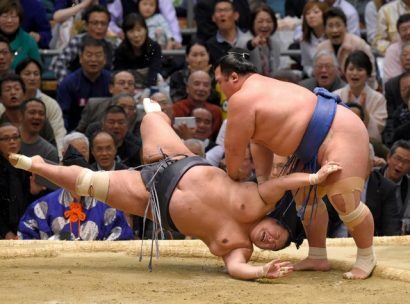 Toyonoshima, the only one to beat Kotoshogiku in the January tourney, was close to another win as the sekiwake forced the ozeki back to the straw bales. But Kotoshogiku managed to stay in and made a last-ditch thrust down with his left arm that turned Toyonoshima over. 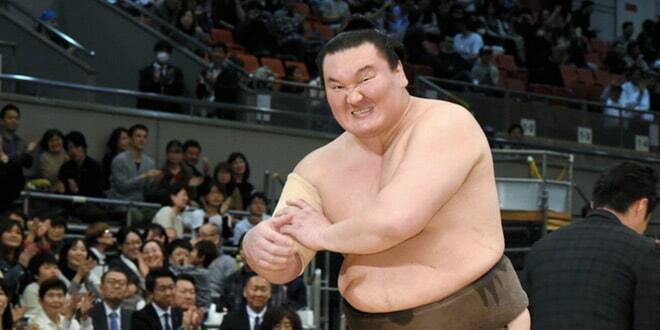 There were no upsets in the upper echelons as all three Mongolian yokozuna and the two other ozeki came away unscathed. 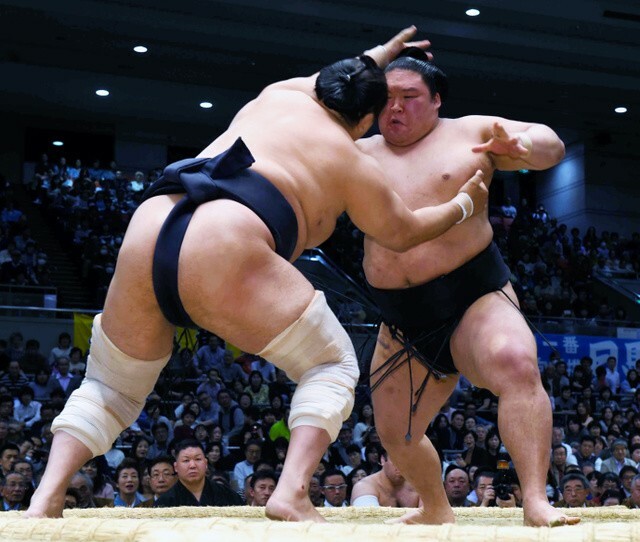 Yokozuna Kakuryu (6-1) was on the back foot against a tricky opponent in sekiwake Yoshikaze (2-5), but calmly slapped down the counterpart, who awkwardly fell forward. 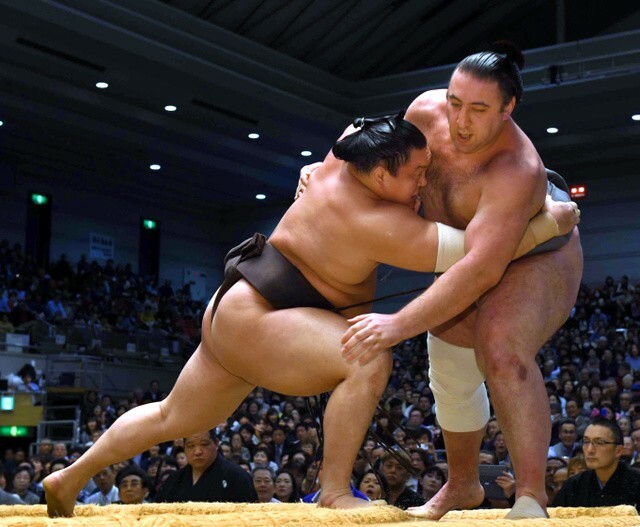 Hakuho (6-1) continued to make easy prey of Tochinoshin (1-6) as he quickly seized a left overarm belt before forcing the No. 2 maegashira out to improve to 23-0 against the Georgian. 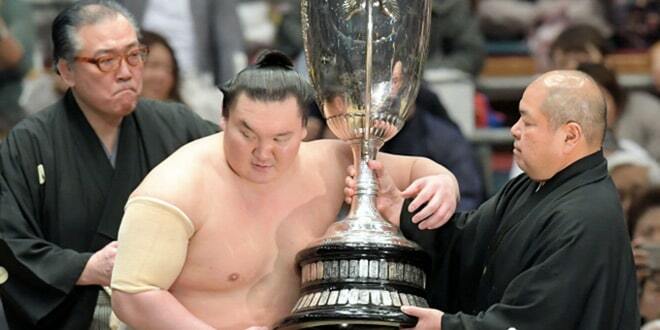 The win was the 964th of Hakuho’s career, tying him for third on the all-time list. Harumafuji (5-2) thrust out both his arms and pushed No. 3 maegashira Aoiyama’s (3-4) head backward before forcing the Bulgarian off the ring. Ozeki Goeido (6-1) was untroubled against Aminishiki (4-2), pushing the veteran out within a matter of seconds after the No. 3 maegashira failed in a half-hearted attempt to pull the ozeki down. Terunofuji (5-2) overcame tenacious No. 4 maegashira Sokokurai (1-4-2), eventually forcing out the Chinese as he desperately clung on at the edge of the ring. Osaka native Ikioi stood his ground against charging Myogiryu (5-2), flooring the No. 6 maegashira with an armlock throw. No. 11 maegashira Mongolian Ichinojo (6-1) downed seventh-ranked Brazilian Kaisei (4-3) with an underarm throw in a lengthy bout between two giants to stay among the five wrestlers one win back of the leaders.